After a long drive from Denver, Colorado, we decided to spent the night in Kearney before moving on the Kansas City, Missouri. We headed out into the Great Plains and found a whole bunch of poker straight roads and, well, nothingness. 6 hours of nothingness, to be exact. It’s incredibly difficult to keep to a 75mph speed limit when the road stretches out endlessly in front of you and only the occasional passing of a FedEx convoy or enormous oil tanker reminds you that you are, in fact, driving and should really be paying more attention to the roads. 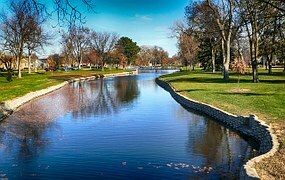 Kearney is a University City in the South of Nebraska and home of the University of Nebraska-Kearney, which is also one of the city’s major employers. The city is really well located on a major highway and is within easy reach of a host of other cities and states, namely Denver (obvs), Kansas City, Des Moines in Iowa and Wichita in Kansas, to name but a few. It is pretty small in relation to other US cities, but has a lot to offer visitors. It is located on the Pony Express, which was an early postal service delivering mail all the way from Missouri to California, by way of the Great Plains and Rocky Mountains. That’s one massive mail route and you can’t help but wonder just how long it would take you to receive first class mail on horseback. Kearney is also located on the Lincoln Highway, which was America’s first transcontinental highway for automated vehicles. Cars and such, I suspect. The Highway originally ran from Time Square in New York state aaaaall the way to Lincoln Park in San Francisco, California. Most of it still exists, with a number of improvements and changes of direction, and the road still traverses the US from East to West coast. Helpfully, it also goes in reverse, so you don’t have to stay in SF if you decide it’s not for you. A 39 acre state park, Fort Kearny was originally built to house Overland Trail travellers and was also a home station for the Pony Express. Its history has been well preserved and there are many trails to be walked, fish to be caught and camping to be done. The old blacksmiths shop has been rebuilt and the old fort fencing and sod house can also be viewed. If you are interested in the history of the old west - it is a great place to enjoy a stroll while learning about the Overland Trail. MONA houses a collection of more than 6,000 works and tells the history of Nebraska through its art. Pieces include those by Nebraska locals, as well as internationally renowned artists and celebrates the culture and background of the state by showcasing its rich talent. As well as the permanent collections, MONA has a rolling programme of special events and exhibitions to ensure there's always something fresh to experience on your visit. Admission is free of charge and there's also a fantastic shop on site. 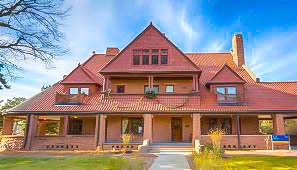 Forming part of the University of NE, Frank House was designed by local architect, George William Frank, Jr. I've no idea how he came up with the name, but the property was a gift for his parents who were, presumably, also called Frank. The house was the first to be wired for electricity West of the Missouri, so that's pretty impressive, even if the name is unoriginal. 'We Have Lights and You Don't House' would have been so much more satisfying. 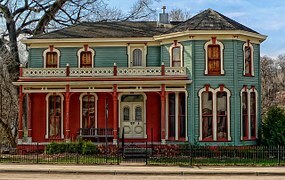 In addition to being used as a regular house, the property has also spent time as a sanitarium and a tuberculosis hospital. Now it is preserved on the register of Historical Places and is part of the University. It is a fine house, both inside and out, and admission is free of charge. It might not sound like that much fun at first sight, but the museum not only serves as a memorial to Nebraska's Firefighters, but also as an educational centre to teach people about the important work the Fire Brigade are involved in, as well as providing information on fire safety and prevention. If that wasn't enough, they have Fire Engines, y'all! Lots of 'em. And you know what they say about fire engines? Yep...they usually come equipped with Fire Fighters. That might be worth the $6 entry fee in itself. 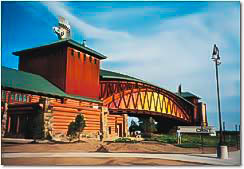 The Archway represents the settling of people in the West of the US via the Lincoln Highway and is now one of the countries busiest interstates. You can go back almost 200 years in history and see the lands and people developing the passageways and roads that have brought them to present day. The bridge itself is beautiful and the displays are well thought out and of a high standard. If you, like me, knew absolutely nothing about the history of Kearney and Nebraska, you won;t be disappointed that you popped in for a visit. Also: The Archway was a mascot called Archie (obviously) and he looks a bit like a Highland Cow. He's fabulous. Depending on the time of year you're visiting Central Nebraska, you might be lucky enough to see the spectacular sights of the Standhill Crane migration. There are literally millions of them*, and Kearney is famous for having some of the best viewing sites along the Platte River for watching the elegant birds take flight. Have you visited, lived or worked in Kearney? What are your tips for things to do? *That's probably not true, but there are a LOT.